NOVEL IDEAThere's nothing like kicking back with a Guinness and a good book at Stout Brothers. Whether it's cold and rainy, or bright and sunny, there's nothing as satisfying as cracking open a new book and diving in, and not just at home. Here are a few Santa Rosa locales that best pair with a slew of new releases by North Bay authors. Splitting her time between Sonoma and San Francisco, novelist Terry Gamble sets her works in the Midwest where her Irish ancestors settled in the early 1880s. Gamble's latest novel, The Eulogist (William Morrow), continues the trend by telling the fictional story of an Irish family in pre-Civil War Cincinnati who experience the political and cultural shifts in America through the eyes of immigrants. 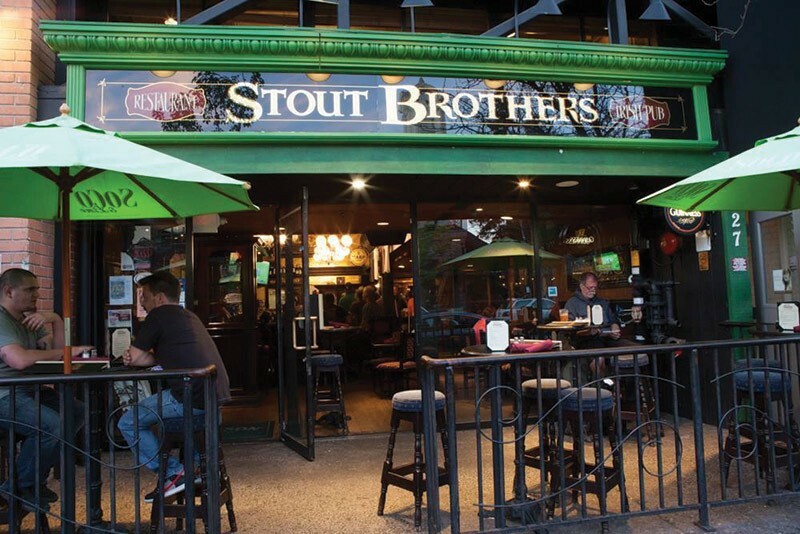 For this richly realized Irish family drama, grab a Guinness and sit at Stout Brothers Pub & Restaurant on Fourth Street near Courthouse Square. Whether you feel like curling up in a dark corner or sitting in the sun at the small outdoor seating area, nothing compliments Irish eulogies like a wee dram. Northern California author Kerry Lonsdale is acclaimed for her best-selling novels All the Breaking Waves and her Everything trilogy. Later this summer Lonsdale unveils Last Summer (Lake Union Publishing), a dramatic novel about trauma, memory and discovery. Following a woman suffering from memory loss after a tragic car crash, Last Summer travels from the Sierra Nevada Mountains to the slopes of Alaska in an adventurous journey. To recreate these mountainous settings, trek the trails to Hood Mountain in east Santa Rosa. Straddling Kenwood in the Sonoma Valley, the park boasts panoramic views of the Bay Area that can be seen from the mountain's peaks on a clear day. Forestville native, journalist and author Michael Levitin has a knack for taking on contemporary issues in projects like "The Occupied Wall Street Journal," and lately he has been turning heads with his debut novel, Disposable Man (Spuyten Duyvil Publishing), which takes a timely stance on issues like masculinity, feminism, generational conflicts and even anti-Semitism. Set in Berlin, the novel tells the story of an American grandson of Holocaust survivors who comes to term with his past and himself. It's a heavy novel with a European vibe, so coffee needs to go with Disposable Man, and readers should head to A'Roma Roasters Coffee & Tea on Fifth Street in Santa Rosa's Railroad Square to sit in front of the café's old stone facade, watch the SMART trains pass by and sip a cappuccino. Santa Rosa songwriter-author Abraham Entin has spent a life on the edge, and he recounts it all in his new memoir, Living on the Fringe (Steiner Books). Starting with Entin's life-changing decision to torch his draft card in 1966, the story is sometimes harrowing, often hilarious and always illuminating—and it's the perfect book to have in hand when visiting Santa Rosa's 'South of A' arts district, where you can browse exhibits at Santa Rosa Arts Center and other galleries, see fringe theater masters the Imaginists, get resources at the Peace & Justice Center and enjoy a great meal at the Spinster Sisters Restaurant.